As a high schooler you may want to keep all the tools you may possibly need for the next year. Nowadays, many students use tablets and mobile devices for getting help in studies. 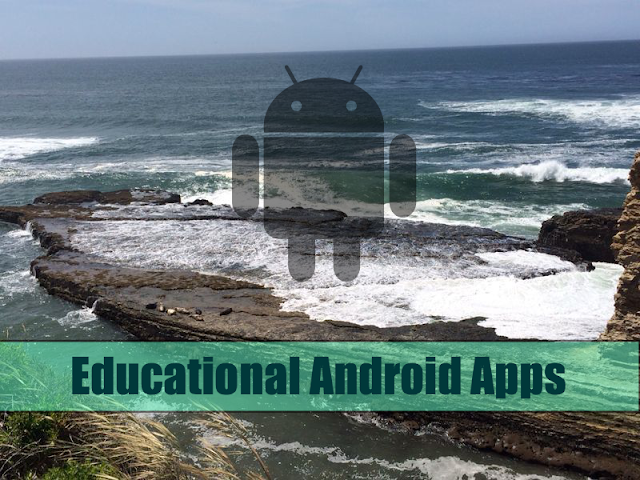 Android platform has tons of amazing apps for education. The types of apps are ranging from math, reading, physics, chemistry, general knowledge , productivity and educational games. This roundup of best android apps will cover some really useful one. With this app, you can access free and fast internet, from anywhere. This WiFi manager establishes an automatic connection with free Wifi and provides access to private or public Wifi hotspots, all over the world. Without any complicated terms or settings, you can easily check the nearest available open network and connect to the same. If you wish to solve basic mathematical problems with high speed and accuracy, you can benefit from the tips and tricks provided by this app. You can make use of simple addition, subtraction, multiplication and division tricks to impress your friends or score good marks. This app will provide you with intense brain training exercises so as to help you improve your speed of mental calculations. These mental exercises, when done on a regular basis, will keep your brain healthy and fully functional. If you are finding it difficult to do your mathematics homework, you can take help of the never-ending list of mathematical formulas, images and descriptions provided by Pocket Mathematics app. This free and easy to use app covers all the topics falling under primary school as well as university curriculum. This app provides more than 11,000 hours of free online videos on Management, Engineering and other streams. The videos also include assignments, reference material and subject notes so as to offer complete subject overview. The videos are available for both low and high bandwidths, and can be easily viewed on a mobile, tablet, desktop or PC. Whether you wish to study further, join a new industry or get promoted, Udemy courses will help you achieve your dreams in a fast and easy manner. Udemy offers the world’s largest collection of online tutorials and courses, spanning a variety of topics, such as, photography, marketing, design, programming, entrepreneurship, yoga, salsa, and many more. If you are a History enthusiast, then this is the app for you. It includes information on hundreds of historical events, right from the beginning of the civilization. There are quizzes related to three distinct subject areas: Science and Exploration, Arts and Culture, and Warfare and Politics. This app provides a fun and easy way to understand and learn the elements of the periodic table. It includes audio clips for correct pronunciation, more than 30 reference facts for every element, and test yourself quizzes. If you want help with your Physics homework, you can refer to Pocket Physics. This free, easy to use, education app includes a list of physical formulas, along with images and descriptions. Also, it covers all the topics in high school as well as university curriculum. If star gazing is what you love, this app will provide you with a virtual window so that you can take a look at the visible universe. You can know the most precise location of each planet and star by simply pointing your device at the sky. This app makes use of high tech functionality, accurate 3D universe and GPS technology to provide you with the clearest picture possible. These are some brain games that may be considered educational for high schoolers. Everyone loves exchanging emojis and there can be nothing more fun than playing an emoji guessing game. This family friendly game app makes you exercise your reasoning and logic skills to solve easy and not-so-easy emoji puzzles. This application includes hundreds of questions, spanning nine different topics, to provide you with complete IQ test preparation material. In addition to this, tips to improve lateral thinking and solve difficult problems are also provided. You can even know where you stand by sitting through short self tests. These are some fun and entertainment apps for high school students. Pandora is undoubtedly a haven for all music lovers. Just name your favorite song, artist, composer or genre, and Pandora will do the rest for you. With this app, you will get to discover a large reservoir of popular recordings, both new and old. You can even create personalized radio stations through a free account. This fun and fast mobile app allows you to stay connected with your friends, by exchanging messages, photos and videos. If you wish to save the photos, you will have to take a screenshot of the same. Snapchat will also tell you which of your friends are online so that you can have the best conversations ever. This app helps you improve your musical ear by means of various ear training exercises. This is a fun and easy ear training tool which can be used by professional musicians and amateurs alike. This free app contains a collection of more than 15000 audio books. Each of these books can be viewed online or downloaded free of cost. You can browse through listings of classic best sellers, out-of-print treasures, and new recordings. Books can be browsed by popularity, genre, title and author. If you are short of time to read a book, you can listen to it through this app. You get access to more than 150,000 titles, ranging from classics to best sellers. This app allows you the luxury of immersing yourself into a great story while your hands are busy. This app provides you access to an ever growing e-library, with more than 20 million free stories and e-books. You not only get to read from a wide range of titles, authors and genres, but you can even comment on your favorite e-books and chat with your favorite authors. This app brings millions of books within easy reach. Whether you wish to read a book, a magazine, or a newspaper, you can easily access it through the kindle store. You can borrow and sync ebooks, customize your reads, and sample a book before buying it. This Sleep Cycle clock is indeed a boon for students and does take over needed sleep mode from students and is easily compatible with iPhones. All that the student needs to do is to put this on and under the pillow before going to bed. This app senses the intensity of sleep based on body movements, and once the sleep turns light, it sounds the alarm which awakens the sleeper. Thus, it indeed acts like an alarm only that it has body and sleep sensors and also provides needed stats of sleep patterns, viz., time of going to sleep, wakening time, hours and minutes of sleep gained, etc. This free app allows you to have all your docs, videos and photos anywhere you want so that you can easily access them on the go. Once you save a file to your Dropbox account, it will be automatically saved on the Dropbox website and all your personal devices. Even if you happen to lose your Android, all your content will still be safe. Plus, you can even share stuff with your friends, easily and quickly. OneDrive provides for a single point where you can save your entire life. It allows easy storage and browsing of all documents, photos and videos uploaded to OneDrive, from anywhere and everywhere. Each of the files can be easily managed and shared, while on the go. This app, optimized for Android, is your official companion in the true sense. It allows you to access, view and edit all your Microsoft documents (Word, Excel and PowerPoint), from virtually anywhere. With the help of support for animations, shapes, charts and SmartArt graphics, you have great looking documents on your personal device. This file and application managing app allows you to manage and edit files through your android device or a computer. It even provides uninstall, create shortcuts, categorize and back-up options to your apps. This app is the perfect blend of an application manager, download manager, file manager, cloud storage client, task killer, LAN Samba client and FTP client. With this free app, you can easily manage your SD card files and folders. This high performance tool allows you to browse through and edit your files, compress, extract and sort them in a list view, search and create back-up, as well as access information on free and used space. This Android friendly file manager can be used on both phones and tablets. This app allows you to browse, access, compress, and move and organize all the apps and files, while on the go. You can even share files and create custom bookmarks. Make the internet work for you through this app. It allows you to establish powerful connections between different channels by making use of one simple statement. You can connect channels like Gmail, Facebook, Twitter so as to develop an entirely new communication channel between your devices and services. This app is a must have application for students of all ages. It incorporates a dictionary, thesaurus and a Word- of- the -day feature. Students can have the words pronounced loud to them and examples of how to use the words in a sentence correctly are also included. For students who are curious to know the origins of words, the word origins feature will tell them just what they need to know. This app can help students take notes and organize web media easily. They could take photos, screenshots, typed note or save web page and Evernote will save it, index it and make it searchable for when they need it most. Further, this works on PCs, Macs and other portable devices, so the content you save on one is available to view on all the others. When used well, this is easily one of the best apps for educational users. This App allows you to wade across an avalanche of writing paper assignments without batting an eyelid. You could search online while writing and also save and store docs, and better still, footnote pages with just the click of a button. So no more excuses for not writing your papers, put pen to paper and get going. Hope you will find this list useful. Did we miss any of your favorite app? Dont forget to share in comments. Jason Malone wrote this article on behalf of EssaysOrigin.com, and online review platform to find out best essay writing services.